If we have a lot of instances where we use “n days ago” throughout our scenarios, we can tell SpecFlow to perform a custom conversion instead. In the scenario above, we want to treat “10 days ago” as something special. If we try to run the scenario now we get and error: “System.FormatException : The string was not recognized as a valid DateTime. There is an unknown word starting at index 3”. This is because SpecFlow is trying to perform an invalid conversion from the string “10 days ago” to a DateTime. The final step is to tell SpecFlow to perform a custom conversion when it sees “10 days ago” (or any number of days ago) and needs to transform it into a DateTime instance. If we run the tests now they will execute as expected, and the value that SpecFlow passes to our Given step parameter “userCreatedDate” is a valid DateTime of ten days ago. The [StepArgumentTransformation] attribute can be used without a regex parameter (to match anything), but in this example we’re capturing the digits “(/d+)” representing the number of days ago. It’s important (and potentially confusing at first) to note that the regex in the [StepArgumentTransformation] is matching the entire string that we first captured in the given, i.e. “10 days ago”. From this initially captured string “10 days ago”, we drill down into the actual numeric information that we want, i.e. “10”. These captured digits “10” are then passed as an int to the daysAgo parameter for use in our conversion method DaysAgoTransform which returns a DateTime that SpecFlow passes on to our Given step parameter. SpecFlow passes us a weakly typed Table object contain the rows/columns. 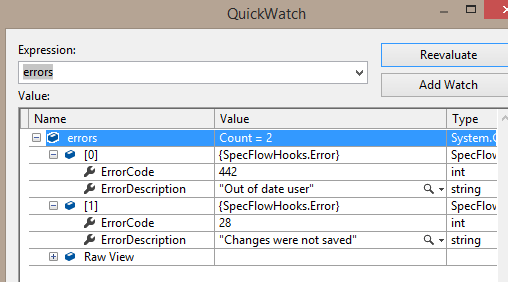 To learn more about step parameter conversion, check out my SpecFlow Tips and Tricks Pluralsight course. I have not used Step Arguement Transformation yet in my projects, though I have dealt with above mentioned examples. I simply transform input into the required types in the step definition itself. I'll try and use the above in forthcoming projects. Good stuff. thanks for all your awesome posts and the great course on SpecFlow. I've been following and supporting the tool from the very (oh well 0.3 or something) versions. Your readers that are comfortable using dynamics can save a lot of typing by using the SpecFlow.Assist.Dynamic package (marcusoftnet.github.io/SpecFlow.Assist.Dynamic/). In this package you'll find methods that transforms tables into dynamic objects, and hence you don't need the typed classes. There's quite a lot of times that I've ended up with a lot of classes that only is used by my specs. Can we specify order to feature file to run on order basis.